With TweakFPS you avoid the need for moving sliders and settings back and forth for different types of flying, IFR, VFR or for special scenery such as MegaScenery. You also cut out the need to continually edit the FS9.Cfg manually, a tedious task at the best of times. After applying the mode TweakFPS will launch FS2004 with your preferred flight (assigned via the 'Settings' page). The Scenery Mode names and descriptions can also be changed (except the protected "Original FS9.Cfg" Mode) by right-clicking on them. If for any reason the custom config did not work out or you want to revert to the program default you can do so by clicking the 'Restore' button. 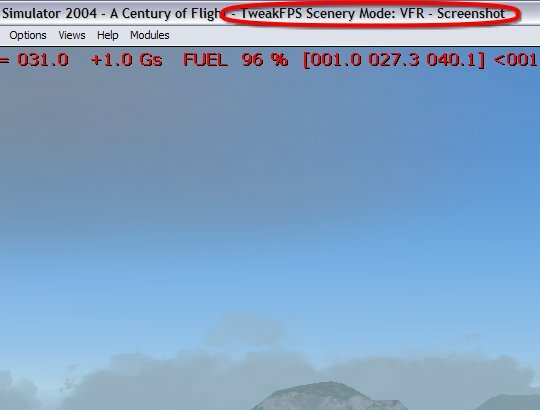 PCPilot reviewed TweakFPS in issue No. 30, pages 26-27. If you have a fast connection click on the icon to the left to load the PDF file into your browser, otherwise right-click it and select "Save Taget As..." to download it. Each key in the FS9.Cfg file has a format and range that is required by FS2004. When setting up a custom mode double-clicking on the variable brings up the small "Edit Value" window. Hovering your mouse over the input box will give you a tooltip with information on the range of the variable (eg. 'TrafficDensity Range = 1-100'). 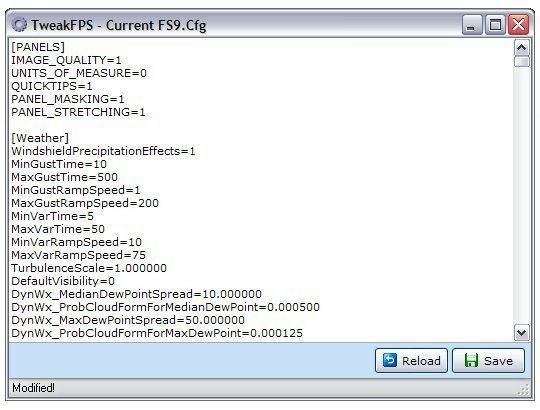 For those who like the power of editing the FS9.Cfg file directly TweakFPS provides a simple integrated text editor that you can use to make any other changes. Generally speaking utilities are fairly plain-looking. We have also put much thought and effort into making TweakFPS pleasing to the eye. We recommend running TweakFPS under Windows Vista or later for the best visual experience.